Dettol prescriptions are currently not available via our online consultation service. You can, however, request an online consultation for flu -viral infections. 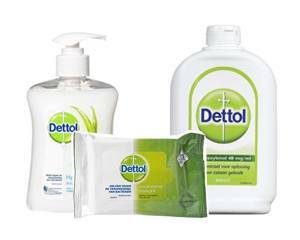 What are Dettol products used for? Dettol skin care products contain antiseptic ingredients and protect against bacteria, viruses and other pathogens. The Dettol range includes hygienic wipes, hand wash and disinfectant liquid. Dettol keeps you fresh and clean all day long, whether at home or on the road, and reduces the chance of illness or infection. Dettol protects your health and that of your loved ones. Dettol Hygienic Personal Care Wipes: for on-the-go protection when there's no water or soap. The wipes contain a mild lotion that cleanses without irritation. Ideal for cleaning children's faces or dirty hands. Each pouch contains 15 hygienic wipes. Dettol Hand Wash: cleansing hand wash that kills 99% of the bacteria on your hands. Provides optimal protection during hand washing. Dettol hand wash is available in various forms, including sensitive hygiene hand wash, original hygiene hand wash, skin care hygiene hand wash (with added moisturiser) and nourishing hygiene hand wash. All products in this range have been dermatologically tested and have a pleasant scent. Dettol Disinfectant Liquid: for antibacterial skin cleansing of cuts, scrapes or insect bites. The liquid can also be used on plastic toys and surfaces in the home such as kitchen worktops, floors, doors or cutting boards for general disinfection. The active ingredient chloroxylenol kills many different types of bacteria. Dettol products can be used as often as necessary. The hygienic wipes and hand wash are ready for use. Dettol disinfectant liquid should always be diluted first. For disinfecting wounds, dilute 5 ml of the liquid in 100 ml of tap water. Apply the diluted solution on the skin using a cotton ball or gauze. Avoid contact with the eyes, nose and mouth. One or two applications a day should be sufficient. Read the package leaflet before use. Do not use if you allergic or hypersensitive to any ingredients in Dettol products (see the package leaflet or label on the package).